The Leda pant by Verve is world-famous in climbing and outdoor adventure circles. This pant is simply a must-have. If you go into a Yoga or Pilates class in Boulder, Colorado, at least half the women will be wearing this. If you go on a hike here, you'll see more Leda pants than anything else. Why? Well, in a place like Boulder, where serious athletes abound, they demand the best of function and form. Leda pants, a cult favorite for the past fifteen years, are one of the first pieces of women-specific climbing clothes made. Modeled on, and named for, the favorite climbing pants of a beautiful girl Verve founder Christian Griffith met in a climbing gym, these pants are tough enough to stand up to sharp rock, flexible enough for morning yoga, and soft enough to curl up in. The simple design focuses on superior fit and has no pockets or side seams while the extra stretchy fabric guards the perfect shape of this pant even in heavy use. A great blending of fit, function and fabric, the Verve Leda pant has become a timeless silhouette which ages uniformly and gracefully. This is crucial: as the Leda transcends seasonal styles, you'll find yourself loving and living in the Leda pant for a dozen years to come. In it, you'll find an intimacy of details, and an evocative awakening of emotions; it dovetails into what is important in your life and adds a kind of simplicity that makes sense. This is the perfect pant. Just the right amount of stretch, sturdy (but stylish) fabric. Great fit. I love all 3 of the Verve Leda bottoms that I have: shorts, capris, and pants. The pants are perfect for lounging at home or throwing on after a workout. They drape nicely and hold up to many washings over time. I have a couple pair that are several years old and are going strong! Wonderful quality, fit is TTS. I usually wear 6/29 bottoms and I wear a small in Verve bottoms. These have not been available for months in my size, and I was very happy to receive notification from Vickerey that they were back in stock. They are well-made, comfortable and my go-to pants for home and running errands. They can't be beat for washability. I do hang them to dry, though they go through the dryer just fine. I ordered my usual black in size small, but also tried the smoke blue this time. Love them! The color is not bright but subdued and goes with everything. A nice change from black. Thank you, Vickerey, for carrying these great pants! Merchant Response:Thanks you for shopping with us and taking the time to review! I love my new Leda pants. I find them much more comfortable than tights and I wear them anywhere because they're such a nice-looking pant. The weight and quality of the cotton is fantastic. Over 15 years ago I bought a couple of pairs of the Leda capri pants. They're still going strong, with yoga, gym climbing, and outdoor climbing subjecting them to lots of wear. 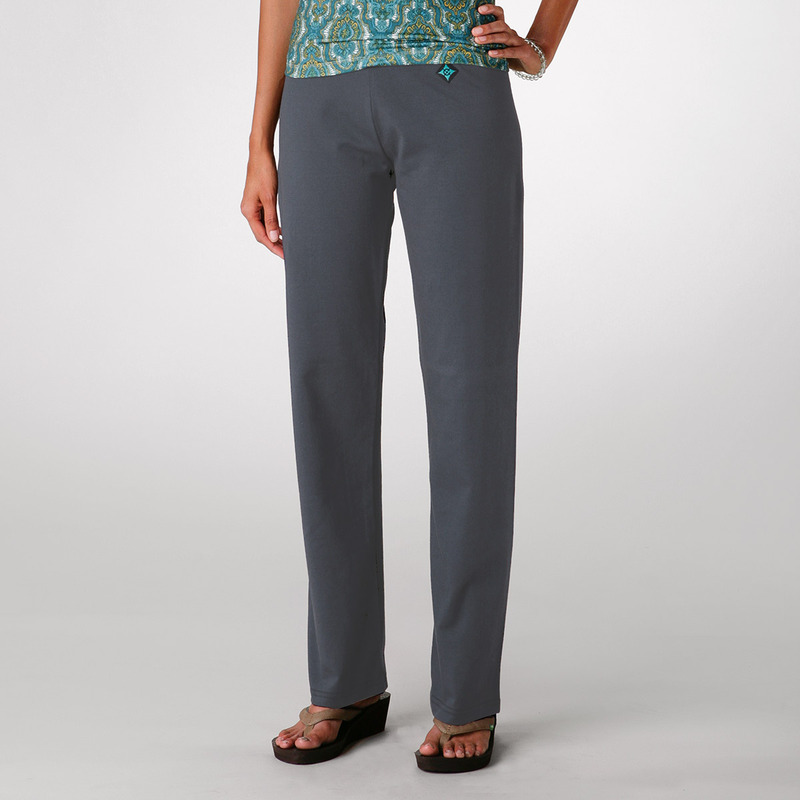 Merchant Response:Leda pants are a perennial favorite and we're glad you're a fan! Thanks for the review. Have worn them for years to workout and do yoga. It is my daily uniform! Great quality, long enough for my long legs so they don't become "high water" length after numerous washings. I buy 4 pairs at a time and replace them every year or so when the black fades. Superior product, fabric. I LOVE these pants!! So comfortable and fit very well. These pants are the most comfortable I have ever owned. They can be dressed up or down. If Verve would just go back to offering them in a range of colors other than black, they would perfect! I am the happy recipient of a new pair of Leda pants. This is my third pair in 5 years. They endure and endure. I love these pants. I use them for workout which includes yoga, meditation, and general home comfort. Love the different colors and sizes, I am petite and find my size is pretty consistent so I can order and know they will fit they day I get them! Happiness! The only pants I wear! I've been wearing Verve Leda TALLS for as long as you have been making them! ProsThey fit really well and are soooo comfortable for just about any purpose -- gym workouts, yoga, climbing, office or a night on the town. ConsLately you haven't had many options for size or color in the TALLS -- please bring them back! I have lived in these pants (as well as the Verve Leda short) for many years and have recommended them to many. Two complaints: 1) They are too long. I always have to hem them, and 2) the elastic band is completely unnecessary. I always snip a small hole on the bottom INSIDE part of the waistband by the side seam and cut the elastic. They are much more comfortable and still perfectly snug at the waist. Fortunately, the designer doesn't sew the elastic into the waist seam, thank heavens. Constoo long. unnecessary elastic strip sewn into the waist panel. I always snip it out. Perfect. I have been ordering and wearing these pants for many years. They are my go-to every day. ConsNeed to come in petite. I hem them each time they arrive. Ordered the Leda pants for yoga, after seeing them worn by my yoga teacher, fit nicely and made well, love the material...and flexibility the provide. Terrific for all these years! I have been purchasing Verve Leda pants for 20+ years. I'm not a rock climber but I do go to the gym faithfully. My trainer in Santa Fe recommended Verve Leda pants from Vickerey many years ago and I still order from them and love using them. They fit well, move well and last forever! I live in Verve Leda Pants. I wear Verve Leda pants for the gym, work and to go our to dinner. I wear the long version with heels, and the short ones for everything else. They look good, wear well and are very comfortable. I have recommended them to everyone I know! Favorite pants on the planet! Fabulous fit and last forever. The quality makes them worth every penny. The fit is correct and very comfortable to wear even on date night, or church. the color fades a several washings, but does not shrink in the dryer. Love these pants. Have about 10 pairs and can't get enough. These pants are comfortable and long lasting. I love them! I have bought these pants over the years and find them very hard to live without. They are a great product. I have been wearing these for years and keep ordering them. I wear them everyday. Well made, beautiful fit, and the fabric is exceptional. 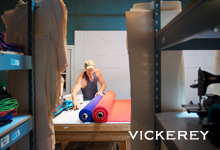 At Vickerey, we've carried Verve clothing for over a decade. We love the classy and functional fit, the durable fabric, and the way it's still handsewn by local seamstresses. And, we love the eccentric, enigmatic man behind Verve: Christian Griffith, climber and designer extraordinaire. Join us for this two-part series that focuses on the man behind the brand, and the wonderful climbing, yoga, and lifestyle clothes he creates. The Verve clothing company is not only committed to producing exceptional products, but to supporting grassroots, sustainable business practices. 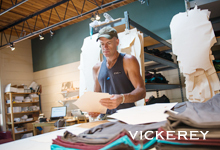 While outsourcing is commonplace in the apparel industry, Verve is keeping it local. They have a group of professional seamstresses who work from home, affectionately called the granny sewing force. Many of these seamstresses left their own countries because of war or its aftermath and made their way to the US years ago. Verve founder Christian Griffith says, "With changes in scale, priorities, and the economy, most of that manufacturing was moved overseas, leaving these highly skilled, dedicated women with little or no means to make a living." Flip over the care label to see the initials of the nice granny who poured her passion into your next pair of Leda pants.